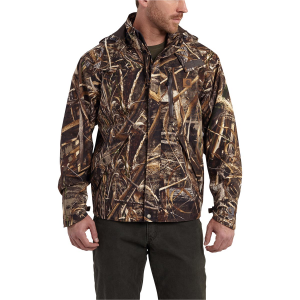 101090 Carhartt Men's Camo Shoreline Jacket Forget the weather channels on tv. 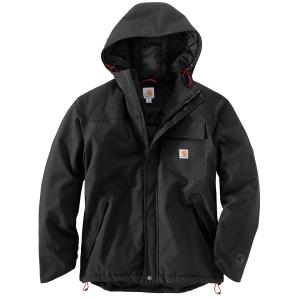 This jacket can handle anything Mother Nature dishes out with its 7.3-ounce, 100% nylon oxford shell and Storm Defender waterproof breathable membrane. The seams are waterproof too. There's a heavy duty front zipper with outer and inner storm flaps and the snap on detachable hood has a draw cord adjuster. The polyester body lining translates into comfort and the taffeta lined sleeves make it easy to get in and out. There are tons of pockets: The left-chest map pocket has a waterproof zipper and the two inside pockets have hook and loop closures. Even the two lower front pockets are special with zippers and storm flaps. Angled cuff openings help keep your hands dry with the help of inner sleeve rib knit storm cuffs. The hem has an elastic draw cord to keep the wet out. 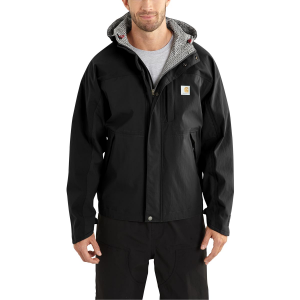 102702 Carhartt Men's Insulated Shoreline Jacket This rain shell offers a light insulation to keep the damp and cold away from your skin. 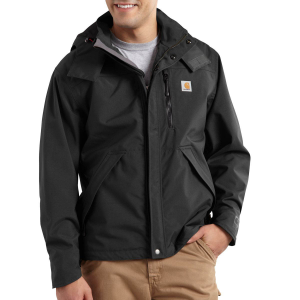 101570 Carhartt Men's Shoreline Vapor Jacket This fully waterproof hooded jacket will keep you dry regardless of the weather outside.